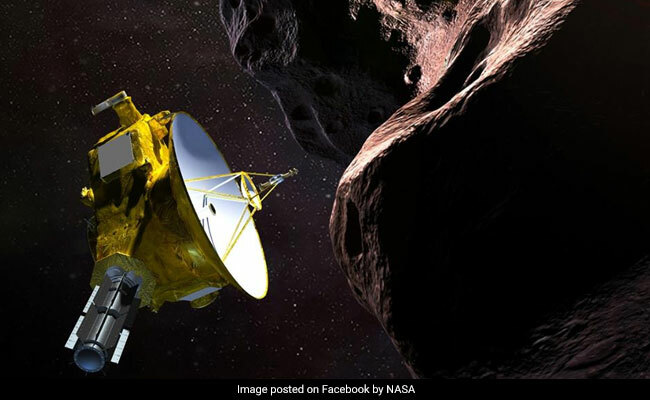 NASA's New Horizons spacecraft is ringing in the new year by flying past Ultima Thule, the furthest space object ever explored by humans. The encounter with Ultima Thule is among the more difficult feats NASA has attempted. The nerdiest New Year's party in the solar system is happening 4 billion miles from Earth, where a lone, intrepid explorer is en route to the furthest object humans have ever explored. There is no champagne in this dim and distant region, where a halo of icy worlds called the Kuiper Belt circles the outermost edge of the solar system. There will be no renditions of "Auld Lang Syne" (in space, no one can hear you sing). But there is a mini van-sized spacecraft called New Horizons. And there is a puny, primitive rock called Ultima Thule, a rocky relic of the solar system's origins, whose name means "beyond the borders of the known world." At New Horizon's birthplace, the Johns Hopkins University Applied Physics Laboratory in Laurel, Maryland, scores of space scientists gathered to study - and celebrate - the occasion. While their fellow Earthlings counted down to midnight, they were ticking off time until 12:33 a.m., when the spacecraft would make its closest approach to its target. In images taken Sunday night, Ultima Thule appeared as little more than an elongated white smear against the darkness of space. But an amazed "oooh" rippled through the APL auditorium when deputy project scientist John Spencer projected the blurred image on a screen. Until then, no one had ever seen a Kuiper Belt object as anything more than a single pixel of light. "This is just a first glimpse of what is rapidly going to get better from here on out," Spencer said. "We're going to learn more very soon and we just can't wait." This is the biggest and busiest moment for the New Horizons team since its spacecraft soared past Pluto three years ago, capturing detailed close-up photos of the distant dwarf planet. Helene Winters, the missions project manager, said spacecraft operators have been subsisting on chocolate and sleeping on air mattresses at APL so they can make the most of every minute until New Horizons reaches its target. Navigators have kept a watchful eye out for potential hazards, which can be hard to spot in this dim and distant corner of the solar system. But because it takes more than six hours for light signals to traverse the vast distance between the Kuiper Belt and Earth, it is already too late to change the spacecraft's course. Its command sequence has been pre-programmed. Its trajectory is sealed. That same light time delay means scientists won't know til Tuesday morning whether the fly by worked. Asked if she thinks she will be able to sleep Monday night, Winters laughed. "Ask me again tomorrow." New Horizons, which launched in 2006, is the first NASA mission designed specifically to explore the outer solar system -- a region that project scientist Alan Stern calls "a scientific wonderland." Out in the Kuiper Belt, where sunlight is 0.05 percent as strong as it is on Earth, and temperatures hover close to absolute zero, the primitive building blocks of planets have persisted unchanged for 4.6 billion years. "This is history making what we're doing, in more ways than one," Stern said. Not only is Ultima Thule the most distant planetary object ever explored, it is also likely the most primitive. Unlike planets, which are transformed by geologic forces in their interiors, and asteroids, which are heated by the sun, Ultima Thule is thought to have existed in a "deep freeze." "It is probably the best time capsule we've ever had for understanding the birth of our solar system and the planets in it," Stern said. The encounter with Ultima is among the more difficult feats NASA has attempted. The great distances from Earth and the sun mean scientists must put up with a long communications lag and instruments must operate with very little light. Ultima Thule was only discovered four years ago, and its orbit and surroundings still aren't well known. And New Horizons is a 13-year-old spacecraft; its power generator produces less wattage than it used to, which means operators must carefully prioritize their use of remaining fuel. "I can't promise you success," Stern said Monday afternoon. "We are straining at the capabilities of this spacecraft." The sheer speeds and distances involved boggle the mind. Ultima Thule is one percent the size of Pluto, and New Horizons must get four times closer to image it. At the moment of closest approach, the spacecraft will be moving at a breathtaking 32,000 miles per hour. Its cameras must swivel to track Ultima Thule as it passes by; otherwise, all it will see is a blur amid the black. The New Horizons team has a number of experiments planned for the brief encounter. Particle and dust detectors will probe the environment around Ultima. The spacecraft's three cameras will take images in color and black and white in an effort to map the tiny world and determine its composition. Spencer said Monday he is especially interested in those detailed color photos, which could illuminate a "particular mystery" about "cold classical" Kuiper Belt objects like Ultima Thule, which have existed unchanged since the earliest days of the solar system. Though these rocks should be primarily made of ice, they all appear reddish when viewed through the Hubble Space Telescope. It may be that the ices contain impurities that change color when struck by cosmic rays, Spencer said -- a possibility he hopes to pin down by looking into craters of more recently exposed material. "Who knows?" he said. "Anything is possible when you're exploring a new class of world you've never seen before."